Struggling with aging infrastructure, strapped resources, and poor access, privatization is being pitched as the cure to Mexico's water woes. But will it leave people high and dry? MEXICO CITY — On March 22, while the United Nations celebrated World Water Day, hundreds of protestors marched down Mexico City’s Avenida de los Insurgentes toward the office of the National Water Commission. Under a smoggy sky, they chanted through loudspeakers, painted posters, and, arriving at the office, scaled the front gates and erected signs. “El agua es nuestra, carajo!” screamed one poster. The water is ours, goddamnit! A more diplomatic sign read: “El H20 no es un negocio.” Water is not a business. For the past several months, however, that has been a matter of debate. In late February, Mexico’s ruling coalition proposed a change to the General Water Act that would allow for the privatization of Mexico’s water supply. According to the new legislation, the National Water Commission, known as Conagua for its Spanish name, maintains the right “to grant full or partial concessions to operate, conserve, maintain, rehabilitate, modernize, or expand water infrastructure built by the federal government.” Approved by Mexico’s lower legislative house, the bill was set to pass the Senate until it was waylaid — momentarily — by public outcry. Now returning to the legislature after Mexico’s midterm elections in June, the bill’s fate remains uncertain. The new legislation aims to correct Mexico’s broken system of public water provision. Close to 5 million Mexicans currently live without access to clean water. The new bill aims to alleviate this deficit by outsourcing water provision to the private sector, which claims it can provide water better, cheaper, and cleaner than the Mexican government. Mexico’s left-wing parties and grassroots activists, however, foresee heavy costs. Privatization, they claim, will divert water away from Mexico’s citizens and toward its polluting industries. Costs would rise, and quality would decline. They, too, acknowledge the deficit in public investment, but suggest the opposite solution. According to the grassroots movement, reforms should strengthen the public sector. The state must guarantee Mexico’s constitutional right to “safe, acceptable, and affordable” water. “We are in an extreme situation of water pollution, overexploitation, and a lack of access to the most vulnerable,” said Elena Burns, leader of the “Water for All, Water for Life” campaign, back at the protest in March. “We are in a critical moment.” Returning to the legislature this fall, the new bill will determine this critical moment — the bottle or the tap, provision for the peso or provision for all, renouncing the public system or beginning the long journey to fix it. Despite the disputes over the solution to Mexico’s water system, there is widespread consensus on its problems. In a recent survey by the Inter-American Development Bank, 81 percent of Mexicans reported that they do not drink tap water, both for a lack of access and a lack of trust in its quality. The history of Mexico’s water is defined by overuse and under-preparation. Throughout the Mexican miracle, as the economic boom from the 1940s to the 1970s is known, industries continually overused aquifer reserves, as politicians sought to promote economic growth. 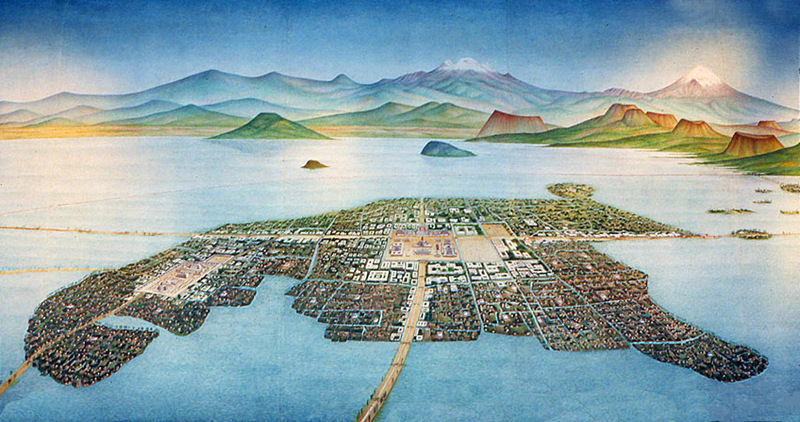 As the boom wore on, Mexicans flooded the cities in pursuit of new economic opportunities. Between 1950 and 1980, the country’s population more than doubled, from 28 million to over 70 million. In Mexico’s cities, where most of the growth was concentrated, water infrastructure could not keep up with increasing demand. Nowhere was this more visible than Mexico City. Once a lake and now a concrete sprawl, Mexico City has long struggled to import water from outside the city and find a way to move its sewage out. In the earthquake of 1985, this weak water infrastructure finally crumbled. In total, 60 pipelines broke on the main aqueduct, with several thousand breaks on the primary and secondary distribution systems. Today, according to official numbers, more than a third of the water in the city leaks out of its underground pipes — a total of some 800 gallons per second. The water that does make it to city taps is contaminated by a variety of bacteria, some of it deadly, by the time it gets there: According to researchers at the Universidad Nacional Autónoma, Mexico City ranks first in the world for gastrointestinal infections from water consumption. But water contamination is a nationwide phenomenon. According to a recent U.N. report, more than 70 percent of Mexico’s total water bodies are contaminated. In many parts of the country, rivers have become so polluted that politicians have reclassified them as sewers — a regulatory trick that also relieves the politicians of the responsibility to restore them. The extensive contamination drove Mexico’s nationwide outbreak of cholera — carried through municipal water systems — in the 1990s. It is in this context that the push for water privatization has emerged. With public water utilities in shambles, the private sector has picked up the slack. Mexico leads the world in bottled water consumption, with an estimated 125 gallons per person annually. It is projected that the bottled water industry will grow to $13 billion in 2015, up from only $9 billion back in 2011. Today, millions of Mexicans depend exclusively on private tankers to deliver their water. In Yuguelito, a low-income settlement on the edge of the Mexico City borough of Iztapalapa, large plastic barrels line the narrow streets, each belonging to a different household. Every day, fresh tankers arrive to fill the barrels, providing residents their only access to the water they will use to wash dishes, clothes, bathe, and cook. Without potable water from the municipality, many Mexicans rely instead on the distribution of garrafones, large jugs of purified water. Every day in Yuguelito, garrafon dealers travel through the settlement on bicycles welded to large metal receptacles to carry the jugs from home to home. This garrafon distribution guarantees access to clean water, but at a huge markup. According to Vargas, purchasing trucks and jugs can cost up to 10 times more than a municipal connection. This means that for communities like Yuguelito, privatization reform misses the point. If the new bill passes, corporations may invest in Mexico’s water infrastructure, improving the quality of municipal resources and the efficiency of its distribution. But privatization does not promise to extend this infrastructure to the millions of Mexicans who currently lack access to those municipal resources. According to many local activists, resolving the crisis for Mexico’s poorest residents, instead, will require a very active role for Mexico’s government. In another community on the outskirts of Iztapalapa, residents used to rely on a similar system of private tankers and jugs. Last year, unable to afford these water costs, residents of La Luz mobilized to protest for water provision, arriving week after week at the offices of the delegation. After several months, the delegation finally relented. Today, the delegation delivers water “clandestinely,” sneaking a hose underneath the entrance of the colony to fill up the water barrels every day. The tale of La Luz illustrates the crucial — if imperfect — role that the government has played in providing water to Mexico’s poorest residents. Through protest, communities like La Luz have been able to apply pressure on and negotiate with their local municipalities. The privatization reform is, then, not merely a question of public vs. private provision. It is also a question of Mexico’s democracy more broadly. With the transfer of water control to the private sector, Mexico’s poorest lose much of their bargaining power. Unable to negotiate on the basis of their protest, they will have to negotiate on the basis of their peso. As difficult as it is to wrangle state support, residents of slums like La Luz may find it even more difficult to meet their needs in the case of privatization reform. The implications of water privatization are, however, more far-reaching than daily provision. For one, while Mexico has pushed its privatization legislation, countries like South Africa, Argentina, and Bolivia are discovering that privatized water yields mixed results. Private management can raise prices, reduce infrastructure investment, and increase pollution at the hands of industry. As a result, more than 180 cities in 35 countries have moved to “re-municipalize” their water systems, taking them out of the hands of the private sector and putting them back under government control. Activists and academics fear that Mexico’s proposed legislation would bring on the same problems that privatization has generated around the world. “We will be subsidizing the private sector,” says Burns of Water for Life, “through direct investment and through subsidies to vulnerable sectors.” According to Burns, corporations will overexploit local resources, and the federal government will be absolved of its responsibility for reducing the levels of arsenic and lead in the country’s tap water. Many fear that water concessions are driven by incoming oil money. Last August, Mexico passed comprehensive energy reform legislation, opening up its oil industry after nearly a century of state control. International oil companies have described Mexico as a “sweet shop,” hungry to import new technologies like hydraulic fracking. While the government’s initial auction on July 15 attracted few bidders — largely due to plummeting oil prices — it expects the rate of private drilling to pick up considerably over the course of the year. The challenge for Mexico’s water reserves will be enormous: Most of the shale deposits in Mexico are in its dry regions, meaning that water is already scarce. So while the quality of the water may improve in private hands, the quantity is in question. Overall, the privatization effort seems to pose a wide variety of new dangers to Mexico’s ongoing water crisis. New concessions may siphon away water from Mexican citizens, pollute the existing sources of water, and ultimately nullify the population’s constitutional right to “safe, acceptable, and affordable” water. In other words, the battle is only half-won. With the vote still on hold, grassroots organizations have continued to mobilize to fight privatization. In May, states like Chiapas, Nuevo León, and Puebla held local conferences to discuss the General Water Act. Under the banner of “without water there is no life,” these local groups organized an 11-day walking caravan, marching toward Mexico City from 30 different states around the country. Thousands arrived in the capital on May 22, swarming the main square to protest privatization. “We have encountered a country torn apart and bloodstained,” they announced in a press conference. The hopeful message is, however, not realistic. The recent victory depended largely on June’s midterm election. Politicians in Mexico seek to avoid controversial legislation close to election time. Once in power, though, they are often willing disregard citizen protest. Similar grassroots mobilizations emerged last year around the energy reforms, when tens of thousands of protestors marched on Mexico City. But President Peña Nieto did not hesitate to push forward with the reform. Following the solid victory of Mexico’s right-wing coalition last month, the objections to water privatization will likely fall on equally deaf ears. When legislators return in September, there is little evidence that anything will stop the momentum of Mexico’s privatization crusade.